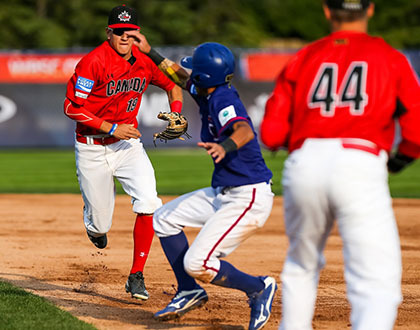 The United States started with a big victory at the World Baseball Softball Confederation Under-18 Baseball World Cup as they chase a fourth consecutive title in Thunder Bay. The Americans brushed aside The Netherlands 11-1 on the opening day of the tournament at the Port Arthur Stadium. Despite their heavy defeat, it was the Dutch who scored the first run before the US wrapped up the Group B game inside eight innings. Elsewhere in the group, Japan and Cuba also claimed big victories. The Japanese saw off Mexico 10-1 with the Cubans racing past South Africa 15-2. In Group A, hosts Canada were disappointed as they fell to a narrow 7-6 defeat against Chinese Taipei. South Korea beat Australia 4-1 and Italy edged Nicaragua 4-2. Further group matches will take place in Thunder Bay tomorrow.